Science Daily (Apr. 17, 2008) - The extra fat we carry around our middle could be making us hungrier, so we eat more, which in turn leads to even more belly fat. Dr. Yaiping Yang and his colleagues at the Lawson Health Research Institute affiliated with The University of Western Ontario found abdominal fat tissue can reproduce a hormone that stimulates fat cell production. Yang identified that the hormone Neuropeptide Y (NPY) is reproduced by abdominal fat tissue. Previously, it was believed to only be produced by the brain. The traditional view is that one of the main reasons why overweight people eat more food is because their brains produce the hormone NPY in excessive amounts. A fat cell cannot replicate itself. But the researchers found NPY increases fat cell number by stimulating the replication of fat cell precursor cells, which then change into fat cells. 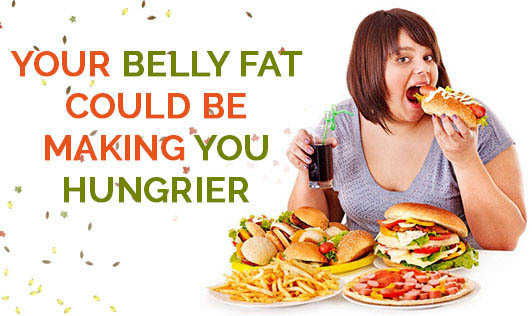 Yang says "this may lead to a vicious cycle where NPY produced in the brain causes you to eat more and therefore gain more fat around your middle, and then that fat produces more NYP hormone which leads to even more fat cells." Being overweight, regardless of where the fat is located, is unhealthy. However, because of its anatomical location and its byproducts, abdominal fat or the apple-shape is known to be the most dangerous. People predisposed to the apple shape are at an elevated risk for heart disease, Type 2 diabetes, hypertension and some cancers.